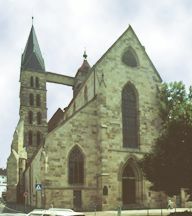 Stuttgart is the major city of Swabia. an island in the Neckar. There are two routes east from Stuttgart. One is to follow the Neckar upstream until it turns south, then continue east in the broad plain leading to Göppingen. The other is to follow the valley north of the mountain ridge on the right/north bank of the Neckar. Following the plains of the Neckar leads us to what is now a suburb of Stuttgart, but once was a thriving center in its own right, Esslingen. The town still reveals its medieval origins, protected by the mountain range that rises quickly from the river to a walled fortress. 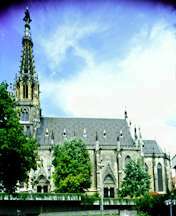 Three churches dominate the view, from across the river, or in the square, and a fourth hides near the old town hall. 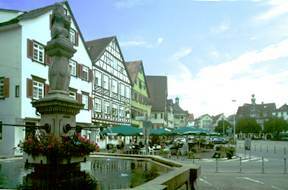 Esslingen town square is immediately north of St. Dionys, with the Münster just off the square, behind the photographer of the picture to the right.